Oregon forests have always been a mix of different aged areas of trees, distributed across the forested landscape in a mosaic pattern. It was even this way pre-European settlement before 1800. Each forested “area”—from a few acres to a couple hundred acres in size—is generally of a like “even-age,” or possible two-aged. In general terms, there are three important forest age-classes in the state’s 30 million acres of forestland: 1) young, open forests; 2) middle-aged dense forests; and 3) older complex forests. When considering nature and the environment, maintaining a portion of forest area within each of these three ages would be desirable. This makes sense because each of these three age-classes provides their own unique and important ecosystem values that the other two cannot. Each age-class offers different tree-size structures, vegetation, aesthetics, biodiversity, aquatic life, birds, wildlife, and animals. Let’s examine how each different forest age-class offers different types of habitat to meet the food and shelter needs for different forest animals. As forests grow from young to old, the resident wildlife will change as the habitat structure changes. Forest animals inhabit young, middle-aged or older forests, depending on their specific food and shelter needs. Some animals are found in forests of any age, while others prefer the vegetation associated only with one of the age-classes: young, middle or older. Managed forests involve harvesting every few years a small percentage of the total area: keeping the life-cycle progressing from older, to young, to middle-aged, to older—and returning again! Site preparation is preparing to establish a new young forest, immediately after harvest, and to replace those trees removed by harvest. The forest begins by planning and modifying the open site (recently harvested) to create favorable conditions for small tree “seedlings” to be planted or germinated. 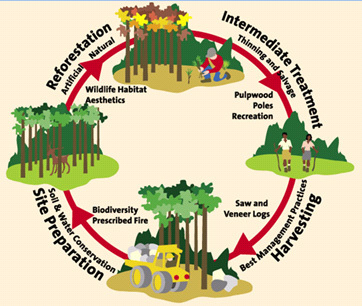 A reforestation and site preparation prescription is carefully-planned by a forest professional (forester), to assure the successful young forest establishment thorough a several year process, which results in a “free-to-grow” young forest within 6 years after harvest (It’s the Oregon law to achieve success within 6 years). At this early step of forest establishment, forest professionals (forester, silviculturist, biologist, hydrologist, soil scientist, forest engineer) evaluate the site conditions, the landowner objectives, and other resource needs, to prepare a prescription that assures the successful establishment, growth & development of the type of young forest planned. Carefully-planned seed trees may be left during the recent harvest, for the purpose of adding natural seeding & seedling germination (adding to those planted seedlings). Reforestation is beginning a zero to 10-year old forest. Within 6 years after harvest, Oregon law requires that successful young forest trees must be established to replace those trees removed by harvest. The “Reforestation” step is the establishment of young tree seedlings that will grow into a young forest. Reforestation is most-reliably accomplished by planting one to three-year old tree seedlings (called “artificial regeneration”). However, the planted numbers of seedlings is often supplemented by the addition of tree seedlings germinated from seeds spread from nearby trees (called “natural regeneration”). And, under special and limited prescriptions, this natural regeneration can be the primary form of reforestation. A reforestation prescription is again carefully-planned by a forester, to assure the successful young forest establishment within 6 years after harvest. Within 6 years after harvest, in Oregon it’s the law that a sufficient number of well-distributed young trees must be thriving and “free-to-grow” as a young forest. That means for each site, a specified number of healthy trees must be established, be able to outgrow competing vegetation, and be able to continue growing as the dominant vegetation canopy. These zero to 10-year old forests provide very important habitat for many species of birds, animals, and diversity of flora & fauna. After 10 to 40 years of forest growth, the now-immature forest has become a dense stand of sapling, pole-sized, or small-timber trees. These immature trees are complete with woody tree trunks, and a closed canopy of foliage overhead. At various times, these immature forests may be ready for one or more operations, called “intermediate” harvest methods, which has the purpose of improving future growth and condition of the forest tree stand. At this earl or mid-life time of the forest’s life-cycle, forest professionals (forester, silviculturist, biologist, hydrologist, soil scientist, forest engineer) evaluate the site conditions, the landowner objectives, and other resource needs—to prepare a prescription that assures the successful future growth & development into the type of mature forest planned. One or several “intermediate” treatments or cutting operations may be conducted, which could adjust the density, composition, health, and structure of the forest trees. Most people recognize the term “thinning,” as a common description of an intermediate treatment method. Logging—or forest thinning—crews of men & women forest workers cut, remove, and/or harvest smaller or mid-size trees—following detailed guidelines that instruct which trees to cut, and which to leave uncut. Forest roads are managed to provide necessary access to conduct intermediate treatments. In some instances, existing forest roads may be reconstructed or new roads built to provide important management access to & from the forest for these operations. Roads move forestry professionals, machinery, crews, supplies, and transport timber products out of the forest to markets. The purpose of the intermediate treatment method is to improve the forest condition, and redirect the future growth, health, and/or forest attributes derived from the forest stand of trees. Intermediate treatments include management activities that usually involve cutting a portion of the trees in the forest stand, for purposes such as thinning, weeding, cleaning, salvage, or improvement. Establishing new tree regeneration (seedlings) is not typically an objective of an intermediate method. Some intermediate treatment methods may cut and remove commercial timber products, such as a commercial thinning forest harvest method is conducted (logs, pulpwood). Intermediate treatment methods may also adjust or enhance desired numbers and diversity of desired trees, shrubs and other vegetation. During the planning and conduct of intermediate treatments in Oregon, many special environmental protections occur, including tree buffers retained along streams-wetlands-lakes, riparian management requirements, forest road standards, fire precautions, smoke management rules, scenic highway buffers, and others. These 10 to 40-year old immature forests provide very important habitat for many species of birds, animals, and diversity of flora & fauna. The intermediate treatments typically improve the amount of biological diversity in these immature forests. After 40 to 100 years of forest growth, the now-mature forest has become a dense stand of valuable timber “crop” trees. These mature trees are complete with tall & thick woody tree trunks, and a dense closed canopy of foliage high overhead. Depending on a range of forest conditions, growth history, and landowner objectives, these mature forests may be ready for one or more operations, called a “regeneration” harvest method, which has the purpose of harvesting and removing most or the entire tree crop. Following a harvesting operation, the forest life-cycle begins afresh, by returning to Step1. Site Preparation. At this mature time of the forest’s life-cycle, forest professionals (forester, silviculturist, biologist, hydrologist, soil scientist, forest engineer) evaluate the site conditions, the landowner objectives, and other resource needs—to prepare a prescription that assures the successful “regeneration” harvest, which has two primary purposes. First, the regeneration harvest purpose is to harvest and remove most or the entire mature forest tree crop. Second, the regeneration harvest plan has a second important primary purpose of creating the open forest conditions favorable to establish a new young stand of tree seedlings. One or two “regeneration” harvest treatments or harvest operations may be conducted, which harvest and remove most trees in the harvested area (harvest unit), or even the entire mature forest tree crop. Most people recognize the term “clearcutting,” as a common description of a regeneration harvest method used in Oregon forests. For several native Oregon tree species and site conditions, clearcutting is the most favorable regeneration harvest method. Other regeneration methods prescribed in Oregon forests include shelterwood, seed tree, and these harvest methods with reserve trees. Logging crews of men & women forest workers cut, remove, and harvest the mature large or mid-size trees—following detailed guidelines that instruct which trees to cut, and which to leave uncut. Forest roads are managed to provide necessary access to conduct regeneration harvest. In some instances, existing forest roads may be reconstructed or new roads built to provide important management access to & from the forest for these operations. Roads move forestry professionals, machinery, crews, supplies, and transport timber products out of the forest to markets. The two purposes for the regeneration harvest method are: 1) to remove most or the entire mature forest tree crop; and 2) to create the open forest conditions favorable to establish a new young stand of tree seedlings. Regeneration harvest treatments include management activities that usually involve cutting most or the entire mature forest stand, and may include additional management activities that prepare the site for tree seedling establishment—such as: piling of logging debris “slash” (tree limbs, tops, broken chunks, cut shrubs); prescribed burning of slash piles or slash on the ground; erosion control mulching/seeding; reducing unwanted vegetation; or thinning of retained young tree saplings or poles. Establishing new tree regeneration (seedlings) is always an objective of a regeneration harvest method. New young tree seedlings of many native Oregon forest trees require open forest growing conditions for which to establish and grow into a tree canopy. Other Oregon tree species at least require partially-open seedling establishment conditions. Regeneration harvest methods always cut and remove commercial timber products (logs, poles, pulpwood, chips, hog fuel). Regeneration harvest methods may also leave extra “reserve trees,” and/or shrubs and other vegetation—to accomplish additional non-timber forest resource objectives (e.g. habitat; structure, aesthetics, riparian benefits, or diversity). Carefully-planned tree cutting is prescribed that assures the successful commercial removal of the mature forest trees, and creating the open forest conditions favorable to establish a new young stand of tree seedlings. During the planning and conduct of regeneration harvests in Oregon, many special environmental protections occur, including tree buffers retained along streams-wetlands-lakes, riparian management requirements, wildlife trees and downed wood retained in larger regeneration harvest areas, forest road standards, fire precautions, smoke management rules, scenic highway buffers, and others. For all the years before the regeneration harvest, these 40 to 100-year old mature forests provide very important habitat for many species of birds, animals, and diversity of flora & fauna. Many regeneration harvest treatments do retain some leave trees, “reserve trees,” or other vegetation, which serves to promote improved biological diversity carried-over into the next young forest established surrounding in these leave trees.